And so, we come to the last entry in the 6-month A to Z self-challenge. After this it will be back to posting whatever, whenever. Today I made this birthday card. 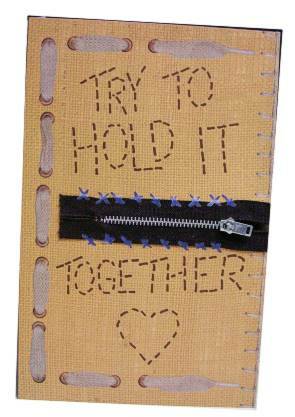 Only the zipper is real (and it does still zip open and closed). All of the other fastenings are rub-ons and the letters are drawn with Sharpie. When the zipper is opened you can see a Happy Birthday sticker inside the flap. And you say "WHAT? What is a Xiphias? I don't remember this on the big list of topics!" And you would be so right! It was not on the big list of topics. I inserted in place of Xylography. I have not done woodcuts before, I really put it off as long as I could and STILL had no inclination to do it. So I inserted Xiphias in it's place. Now as to the definition? It's the scientific name for a swordwish. I printed this guy and cut him out, mounted on scrapbook paper and cut to size. Then I made a picture for the back of it, a sunset on the beach. 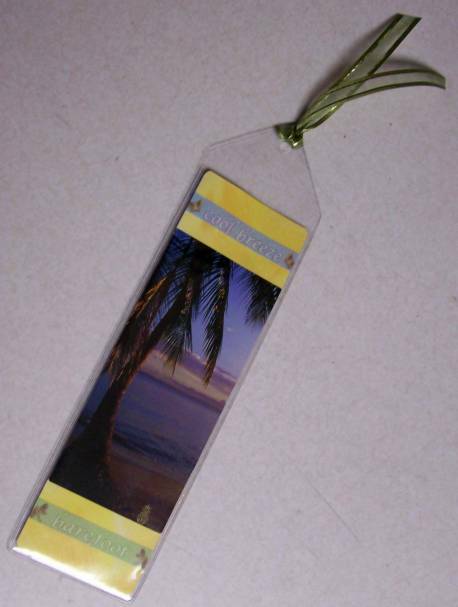 A few text stickers and I slipped it all into a bookmark sleeve, trimmed with a ribbon. 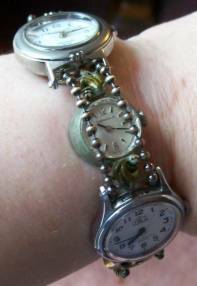 I call this project "Watch Band". 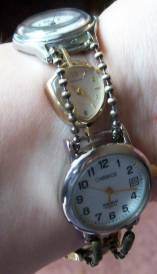 Constructed out of real watches, they link together using their band attachments so alternate between bars and holes. The ball-chain is strung through all the bars to keep the watches aligned and to provide a closing mechanism. Here are three shots of the band so you can see all the different faces while being worn. 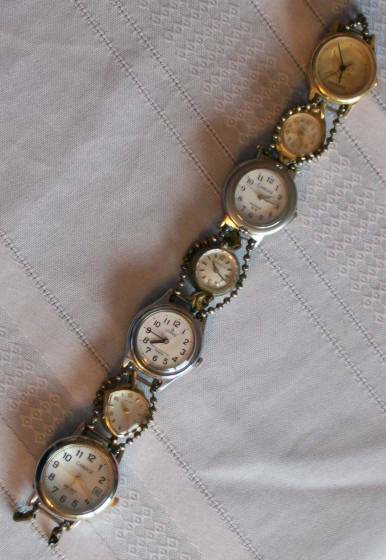 Only ONE of the watches works so it is functional as well as decorative - as long as you can remember which one it is! The ideas for 'Volume' ranged from 'glass is half full' to making a book, but I finally knew it was right when I realized I had to make a 'volume' of items. Now, I do not like to make the same thing over and over so this was a big challenge for me. The way I resolved the issue was to make them all a little different. So what did I make? Inchies! Have you heard of them? 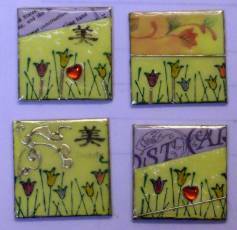 They are one inch square little works of art. 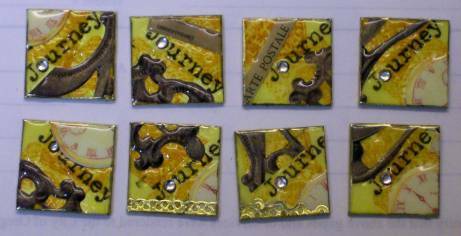 I used yellow Mat board as a base, rubber stamped them with a variety of stamps in a variety of ink colors. These I colored with watercolor markers, added bits of stickers, rhinestones, and then covered with two layers of UTEE. The last step, after adding identifying stickers to the back, was to use metallic gold leafing pen on all the edges. Here are the individual styles - based on the original stamp used. So, you ask, what are these for? 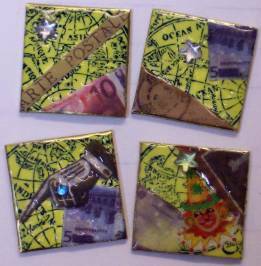 I took them on my Alaska cruise with Tim Holtz to trade with other artists. 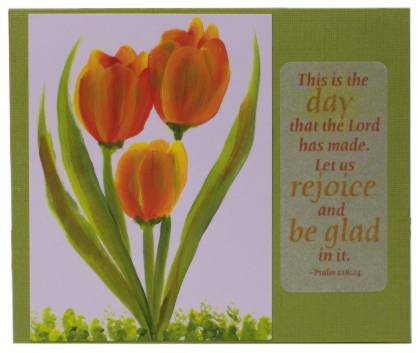 I love the layout of this summery card but in the photo you can't see the theme element - Ultra-Thick Embossing Enamel. 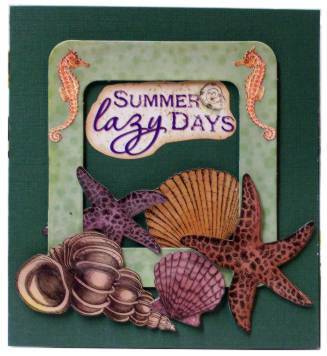 The frame and each of the shells are printed die-cuts. They are covered with three layers of UTEE and mounted with pop-dots. I added stickers for the text and the seahorses. 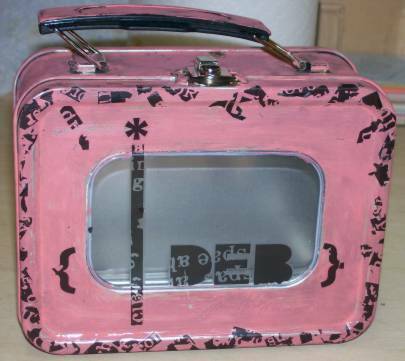 This mini-lunchbox tin has the cutest window! I painted it with Ranger Acrylic Paint Dauber, distressed the paint with walnut ink and added bits of rubons to the edges. 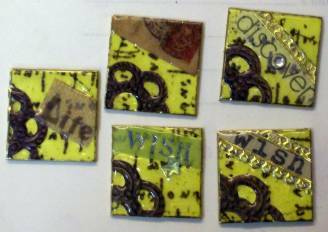 The same rub-ons were used for my name and the other surface embellishments. This well know character is salvaged from a paint sample card. A sticker adds text and it is layered on stitching. 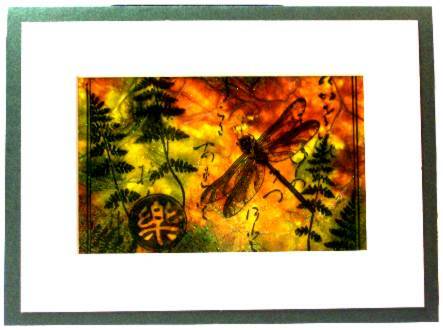 This technique is called 'caught in crystal' and uses white tissue paper, transparency, Future floor wax, re-inkers, and a rubber stamp applied with permanent black ink. I love how this came out. 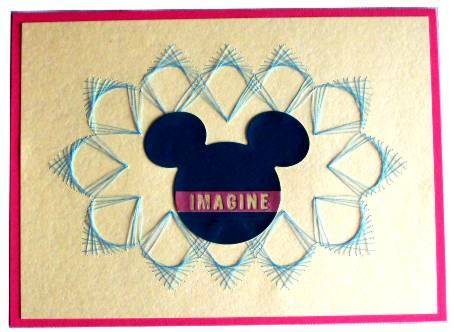 I added a true mat and applied to the front of shimmery green cardstock. Yeah, I decided to do ALL my holidays early this year! 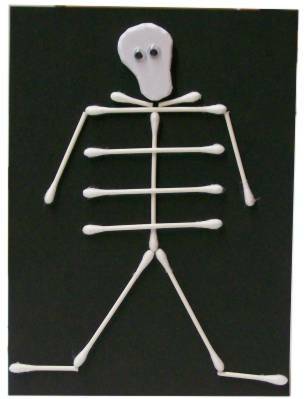 I found this pattern for a skeleton made from Q-Tips on the web. The original was made by a child. I made his head from craft foam and gave him google eyes. I used scraps from my bead project to try out a mokume gane technique. I applied the slices to my single-needle tool and rolled in ultra-fine glitter before baking. Love this! I haven't done any one-stroke painting for a long time. These are the first tulips I have painted. The text is a vellum sticker. 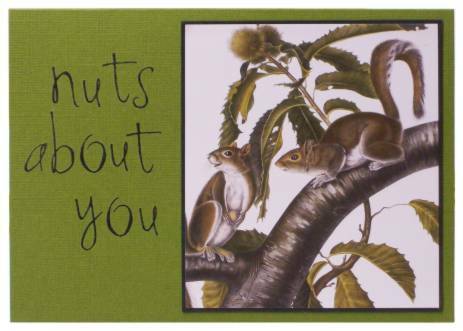 These squirrels are a calendar illustration. I bordered it with black cardstock to match the rub-on letters in the greeting. A digital creation for the boys in my life - This card will probably end up with some little grandsons. 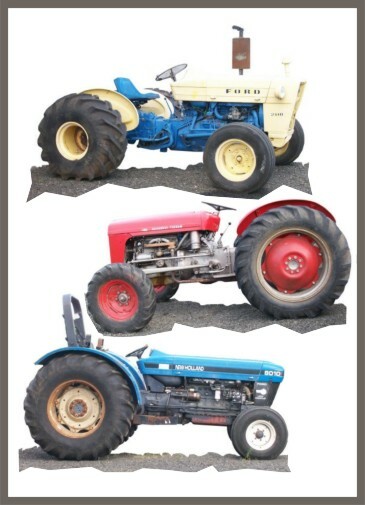 I took the photos on the lot when we went to buy a tractor, recently. Theywere cleaned up in PhotoPaint and combined in CoredDraw9. I created this digital image for the background using Corel PhotoPaint. The idea I had was to use 'tu-lips' for today's theme. 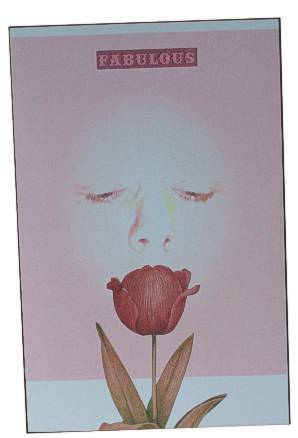 I had this fabulous tulip sticker in my stash and created the colors in the background piece around that. 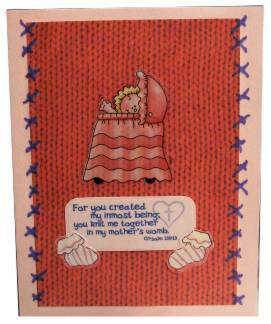 I started this theme with the text sticker and turned it into a baby card. 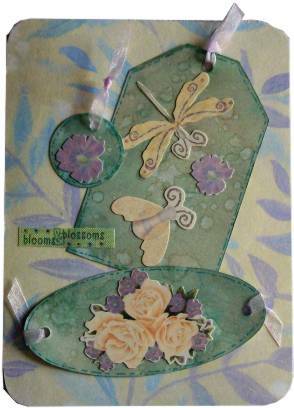 The background is printed scrapbook paper and the stitching along the sides is rub-ons. All the rest is stickers. First time making polymer clay beads. 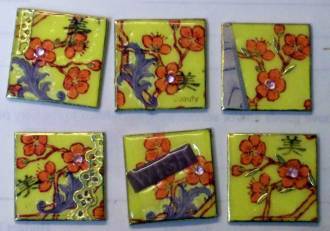 I used translucent clay with a small slice of metallic color for each of 4 bead colors. 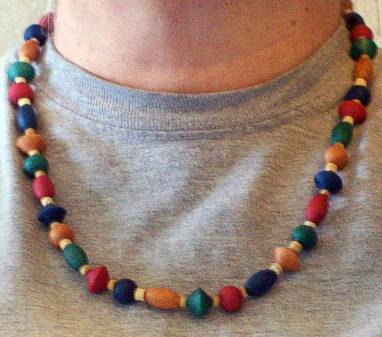 Then I used a bead former that has three shapes to make an equal number of each bead shape from each color. After baking they were strung on stretchy cord with wooden spacer beads. 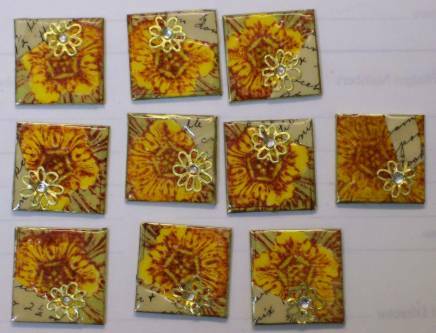 Here is a closeup of the beads. Remember ROYGBIV? It is the mneumonic for the order of the colors of the rainbow: Red Orange, Yellow, Green, Blue, Indigo, Violet. So I decided to include the whole rainbow of colors and set them off against an indigo night sky. 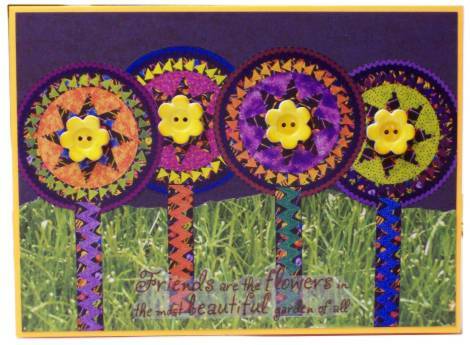 These whirly-gigs are actually cut out from a quilt printed in a calendar. 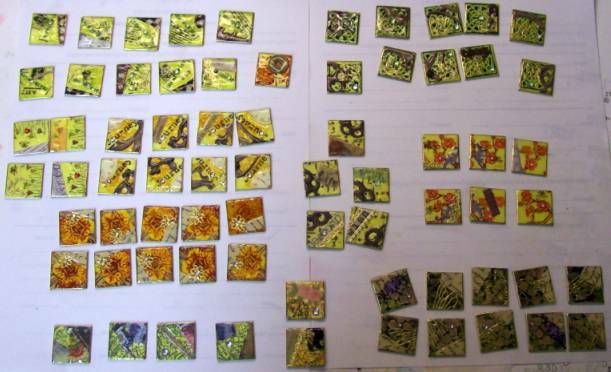 I gave them a scrapbook paper grassy field and dyed flower buttons with alcohol ink for centers. The text is a vellum sticker. I enhanced the print to show up better. I've mentioned before that, although I do not like to do quilling, I do like husking. It's like drawing with strips of paper. I created this bird from a picture of a husking found on the web. 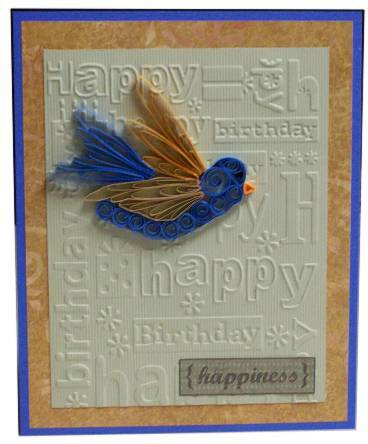 It is mounted on a Cuttlebug background, patterned scrapbook paper and blue cardstock. 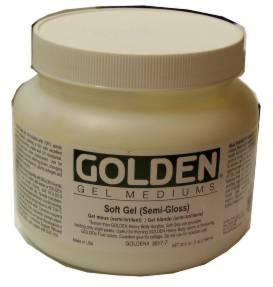 For this project I used Golden's Gel Medium (Soft Semi-GLoss). I used it as an adhesive and a topcoat for covering an old cigar box with wrapping paper collage. 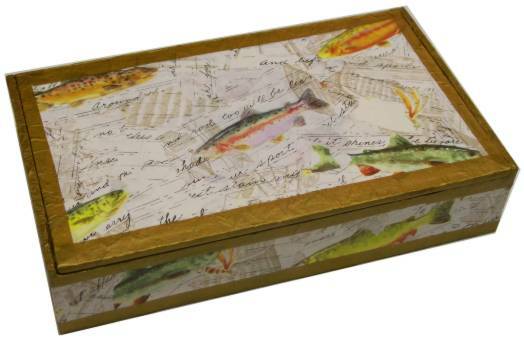 This flyfishing wrapping paper made an attractive collage and I used gold tissue paper as edge bindings. 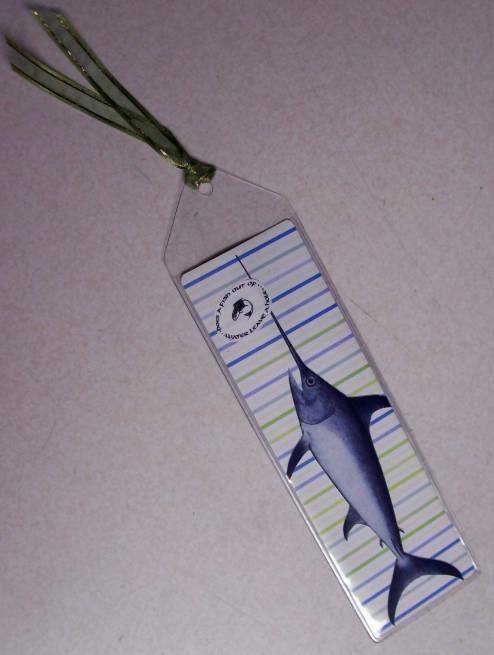 I just love the fabulous colors on these tags! I distressed them and added a broken line around them. They each have a bit of sheer ribbon and garden-themed stickers. The text is a fabric sticker.